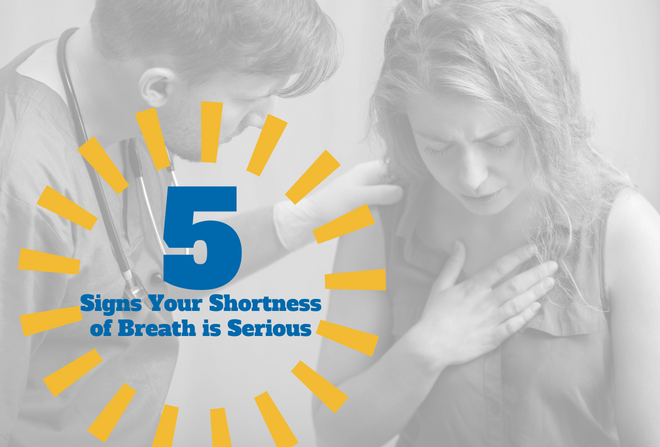 If you suffer from shortness of breath, you’re not alone. It’s a common symptom and one that prompts many people to see a doctor or seek other medical treatment. Knowing when your shortness of breath is an emergency isn’t always easy. It can be the result of hyperventilation, acid reflux, or a panic attack – cases when shortness of breath usually recedes on its own – or more serious issues involving your respiratory health. There are many possible causes of shortness of breath, as well as signs that it’s time to seek medical help. There’s no clear definition of shortness of breath, but most people describe it as a feeling of being unable to get enough air, or that breathing takes more effort than usual. Some people may feel chest tightness. Shortness of breath may come on in a matter of minutes, or develop chronically over much longer lengths of time. If shortness of breath is chronic – meaning it has lasted for weeks or longer – it’s often due to any of the above causes. People who suffer from COPD are also likely to have episodes known as exacerbations in which their symptoms suddenly become worse and persist for several days. Asthma is caused by inflammation of the bronchial tubes. This inflammation also results in the production of sticky secretions inside the tubes. When it comes to your respiratory health, asthma – like COPD – should never be taken lightly. Its symptoms are very similar to those associated with COPD: coughing, wheezing, chest tightness and, of course, shortness of breath. As with COPD, asthma sufferers may go extended periods without experiencing any symptoms before having periods of systems (or asthma attacks). Others may only experience asthma during exercise, or when suffering from viral infections such as colds. Depending on your symptoms, your doctor may evaluate your shortness of breath by using pulse oximetry to estimate the amount of oxygen in your blood, an EKG, a chest x-ray, blood work, or pulmonary function tests. It’s important to note that while you may suffer from COPD or asthma, your symptoms can still be managed – and allow you to lead a normal life – with the right health care team working with you.